Microsoft CEO Satya Nadella laid out his new mission for the company in an email sent out Thursday to all employees. “Our mission is to empower every person and every organization on the planet to achieve more,” he wrote. 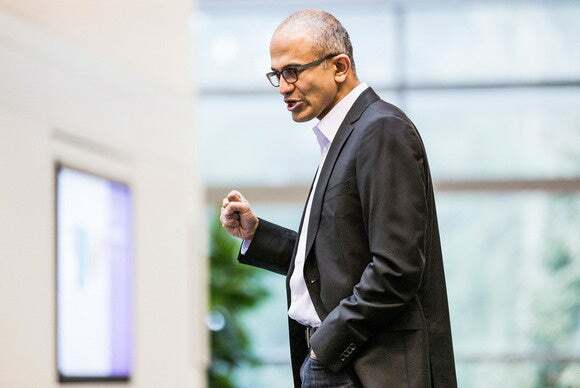 It’s a much briefer mission statement than the one he unveiled when he took over the top job last year, and indicative of the changes Nadella has made since he took Microsoft’s helm. During his tenure, Microsoft has focused on broadening the reach of its services and applications across platforms and has pushed ahead with a new version of its Windows operating system. In the email, which was first reported on by GeekWire and subsequently obtained by IDG News Service, he outlined a trio of strategies that Microsoft will execute on in the future. First and foremost, he said that Microsoft would “reinvent productivity services for digital work that span all devices,” that will appeal to customers in both their work lives and their home lives. Those experiences will be powered by the company’s cloud platform, and delivered in its “best instantiation” through the Windows device platform. To achieve that, the Microsoft CEO said that the company needs “a culture founded in a growth mindset.” In his letter, he listed on three areas where Microsoft should focus: being “customer-obsessed,” “diverse and inclusive” and working together as “One Microsoft.” The last echoes a reorganization put in place by his predecessor Steve Ballmer, which took place in 2013 and was designed to get all of the company’s teams working together. In the email, Nadella highlighted a number of new initiatives in those areas, including internal hackathons, “customer feedback loops” and a new performance review model. He took special care to highlight the company’s diversity and inclusion efforts, including new unconscious bias training. “We will do more and more to support the culture we have and recognize impact when we see it,” he wrote. Nadella concluded by saying that he thinks Microsoft is in a position to seize new growth in its upcoming fiscal year, but that there are “tough choices” ahead for the company. “We will need to innovate in new areas, execute against our plans, make some tough choices in areas where things are not working and solve hard problems in ways that drive customer value,” he wrote. His message isn’t much of a surprise for people who have been closely watching the company, but it’s a barn-raising message that appears designed to inspire employees at a key juncture for Microsoft. Just last week, the company announced the departure of several key executives including former Nokia CEO Stephen Elop and Business Solutions leader Kirill Tatarinov. The company has also undergone a significant set of layoffs beginning in 2014 since Nadella took over, with the “last of the broad cuts” taking place in April of this year.